Happy New Year to all our members and guests. The link can be found below. Remember now till Mar.1st only the Ocean is open for Striped Bass. As always don't be to specific of an area your fishing. We enjoy reading your reports. Surf, boats, fresh water are all good.. Pictures are even better. Good luck, have fun and be safe. For those of you who purchase IBSP drive on permits, they now issue 2 decals again. I'm glad somebody in control figured out 1 decal was not working! First report of 2016! I got a 7" shad on a 5" plug. I don't know how it planned to eat it. First time I got one on anything but a yellow teaser. IBSP 2016 passes are in. They are bumper stickers again. thought my trip with Bass last week was my last....but the weigh-ins continue including reports of bluefish; looks like mid week it's early morning high tide and I will be throwing plugs at dawn....somebody stop me!!!!!!! Birds/fish came into reach 2x with only shorts for very few of the 50 or so blitz chasers that were out today. Fri & Sat I know of 3 people who were mobile in the park for 6+ hours who came up empty both days. Did some bottom fishing the other day on a party boat. Overall a very slow trip plagued by dogfish and conger eels most of the day. Captain worked hard moving us from wreck to wreck but it seemed like the blow the day before shut down most of the action. A pick of smaller sized ling & cod for the boat along with a nice pool winning Pollack caught by one of the kids on board. Who better to win the pool than a young kid? 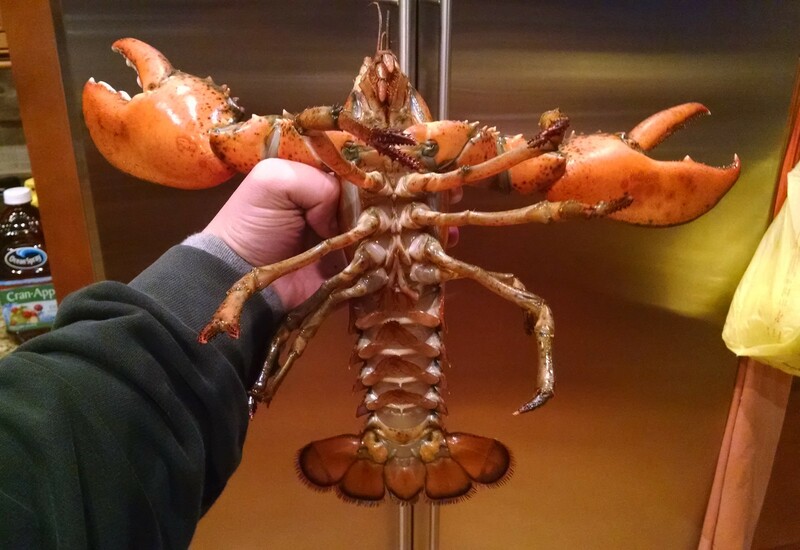 Highlight of the trip was having a nice sized lobster get fouled in my rig. Naturally with a fresh lobster I had no choice but to go harvest some clams the next morning. A full moon tide with low around sunrise only allowed for an hour and a half of clamming. We managed about 100 clams each before we had to retreat to the incoming tide. Nothing beats a fresh seafood Spanish Paella....clams, lobster, scallops, and shrimp all in one dish!!! Yea I was thinking the same thing, sounds even better! The all inclusive state park pass is still a window sticker. Good luck. It's pretty much right time, right place. It may have slowed down bu I wouldn't say it's over. Hit the beach both Thursday and Friday, saw some birds on Friday but not a tap. Hey Hey don't talk that way.